The 1981 Ghia included many luxury items including black remote control side mirrors, body side pin striping, turbine style wheels, low back reclining seats with adjustable head rests and deluxe seat belts with tension eliminators, luxury level cut-pile carpet, and extra convenience lighting (map, dome, glove box, ash tray, engine). Have you ever heard of one of these? 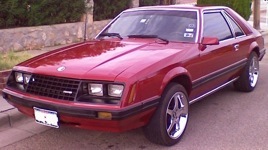 The original window sticker called it a 1981 Ford Mustang Ghia Suncoupe. It is owned by Jason Bourdeau from Langley, BC, Canada. The sticker price was $11K. I believe the 'Suncoupe' if for the sunroof and the vinyl top was an aftermarket item. It has a 3.3L 6-cylinder engine and an automatic transmission.